On Saturday, I repeated the hopping test. I consider the distance covered in 5 hops on one leg is a good test of running-specific strength. Seb Coe used to do a similar test. He could cover 25 metres on 8 hops, but as a cronky old-timer my target is much more modest. Before the episode of arthritis that afflicted me in January 2010, I could cover 9.71 m in five hops on the left leg and 9.24 m on the right. The discrepancy between legs reflected the fact that previous episodes of arthritis had affected my right knee more than my left. In contrast, the episode in early 2010 attacked my left knee (in addition to my left wrist and neck). The arthritic pain lingered through most of 2010, causing me to minimise forces transmitted through the knee. By December 2010, I had lost about 20% of my hoping strength, and now my left leg was weaker than my right; I achieved 7.39 m on the left and 7.44 on the right. My attempts to remedy this loss by plyometrics in early 2011 were thwarted by recurrence of pain in the left knee. Several other health problems also interfered with training but by late summer 2011, I was once again able to train regularly. As described in recent posts, in the following 11 months I trained regularly, unhindered by illness or injury, and my aerobic fitness improved greatly. But by July 2012, I was stuck in a rut. I found it very difficult to maintain a pace of 5 min/Km for more than a few Km despite evidence of good aerobic fitness. It appeared that I had such small reserves of muscle strength that even at 5 min/mile pace I was recruiting not only all my type 1 fibres but also most of my type 2 fibres. Not surprisingly, I could not maintain such a pace for more than a few Km. A repetition of the hopping test in July confirmed that lack of muscle power was the problem. I covered 7.45 m on the left and 7.77 m on the right. Eleven months of mainly aerobic training, with a modest amount of hill work and interval training, had produced only a 2% improvement in hopping. At that stage, I commenced a ‘quick and dirty’ program of weight lifting – ‘dirty’ in the sense that I built up the load quickly, rather than painstakingly developing by the technique and basic all round strength necessary for safe lifting at near maximal capacity. But at that stage, there would be no prospect of going to maximum loading before the RH half marathon in September so I spent a few weeks building rapidly to moderate loads before returning to predominantly aerobic training for the final few weeks. In the event, the strategy worked. I ran a reasonably good half-marathon, and then a few weeks later, a satisfying 5K. What do the Kenyans do? In a balanced review of the issues, Pete Pfitzinger remarks with a touch of irony ‘the Kenyans are so secretive in their iron-pumping that no one has ever seen them lift. Travel to Ethiopia, and you will see an equally impressive absence of muscle-building.’ This observation is indeed reason to consider the issues carefully before embarking on a time consuming and demanding weight lifting program. However, Pfitzinger’s observation must be set against the evidence that very demanding resistance training is not unknown in Kenya. The fascinating video of the BOSS Baltic team including Asbel Kiprop (1500m gold medallist in Beijing and world champion in 2011) training in the rain at Iten stadium in November 2011 reveals an extremely demanding session that included dragging car tyres around a water-logged track; running against a restraining waist band; and intense plyometric jumps over a series of hurdles. While there is abundant scientific evidence that combining weight lifting with aerobic training improves running-specific factors such as running efficiency and time to exhaustion when running in the upper aerobic zone, there is no large study that has demonstrated that weight training improves racing performance at any distance from 5K to marathon. However each athlete is an individual and must weigh up the evidence of what is likely to be helpful for him or her. There is an abundance of anecdotal evidence regarding the benefits of weight training for individual runners. How closely do the anecdotes match my own situation? Her fourth place in the 10,000m final in Sydney in 2000 demonstrated yet again that Paula lacked the strength in the final lap required for victory at the highest level of competition. In an attempt to define the problem, Irish physiotherapist, Gerard Hartmann asked Paula to do 20 hops up and down from a 16 inch high box as fast as she could. In contrast to Kelly Holmes who had had achieved 20 hops on and off the same box in 12.5 seconds, Paula took 27 seconds on her first attempt. This led Hartmann to devise a program of plyometric exercises and heavy weight sessions. In 2002, Paula won her first senior world title (long cross country in Ostend, Belgium) and also won her debut marathon in London, in a time only 8 seconds slower than Catherine Ndereba’s world record of 2:18:47. Later that year, in Chicago, she staked her claim to ownership of the world record by slicing 89 seconds off Nderaba’s best. The following year, in London in April she recorded the awe-inspiring time 2:15:25, a mark that remains unchallenged. In my post six months ago following Mary Kietany’s victory in the London marathon in April, in which she shaved a few seconds of Katherine Ndereba’s best, I speculated that a new generation of Kenyan women might be about to mount a serious challenge to Paula’s record. I should also have added Ethiopian woman to the field of contenders as Tiki Gelana had recorded 2:18:58 in Rotterdam a week before Kietany’s win in London, and Aselfach Mergia had broken the 2:20 mark earlier in the year in Dubai. Indeed there was no reason to limit my horizon to Africa as the second fastest female marathon runner of all time is Liliaya Shobukove of Russia with a time of 2:18:20 in Chicago in 2011, while about a dozen other woman including Mizuki Noguchi, Irina Mitenko and Deena Kastor have recorded times under the 2:20 mark. However, so far there has been no sign pointing to an imminent quantum leap in women’s marathoning. Since April, the only woman to get anywhere near 2:20 was Aberu Kebede with her winning time of 2:20:30 in Berlin in September. Paula’s record from 2003 looks as secure as ever. As I watched the video of the BOSS team training in the rain soaked stadium in Iten, I was struck by the contrast between the male athletes and the lone female athlete wearing a red top and blue trousers. She too dragged the tyre around the track, and battled persistently against a restraining band tethered to a post, but the power of her legs paled in comparison with that of the men. I do not know what distances she races, and wish to draw no conclusion other than noting that the video provided a graphic illustration of the major gender difference in strength, a difference that is manifest in the power of the movements that are required for running. In my post in April I had speculated that women should less severely disadvantaged relative to men in the marathon than in shorter events because the event is largely fuelled by reserves of fat, but I think that speculation missed a crucial point. Even the marathon is an event requiring strength, a point illustrated not only by Sammy Wanjiru in Beijing but even more dramatically by Wilson Kipsang Kiprotich in London in April of this year. His powerful surge shortly after the halfway mark crushed most of his opponents. He tried a similar tactic in London in August. But whether it was merely the heat of that August day or the fact that his body was beginning to fatigue after three top-level marathons within 10 months (starting with his near world record breaking win in Frankfurt in October 2011), his strength failed him in August and he faded to third place behind Stephen Kiprotich and Abel Kirui. Nonetheless, it is clear that the men’s marathon is a test of strength as well as aerobic capacity. I suspect that Paula stands unrivalled among female marathoners not only on account of her tremendous aerobic capacity but also on account of the strength program that Gerard Hartmann designed for her in light of her dismal hopping test performance in 2000. However Paula’s story has a sad coda. After dropping out of the marathon in Athens in 2004 apparently due to complications arising from treatment for a leg injury; her subsequent game but ill-starred attempt in Beijing in 2008 following a stress fracture; and then a failure to even get to the starting line in London in 2012, her Olympic dreams have been dashed. Of course luck plays a role. But the video of her world record breaking run in Chicago in 2002, and of her spectacular run in London the following year, reveal a runner tensing almost every muscle as she strains to drive herself onward. Perhaps the unwarranted muscle tension provides a clue to the contrast between her unrivalled performances when her body lasted the distance, and the numerous occasions when her body failed her. I understand that Gerard Hartmann made a determined efforts to help her reduce the head bobbing that characterised her running prior to 2002, but I wonder whether she might have added an Olympic medal to her otherwise unrivalled record if she had devoted more attention to integrating her strength into a well coordinated, relaxed running style. In a press conference shortly after Mo Farah’s dominant performances in the 5000m and 10000m in London in August, Alberto Salazar described how, when Mo joined him team in Oregon 18 months earlier, he was a skinny distance runner who performed strength exercises like a 90 lb weakling. He recognised that if Mo was to fulfil his potential and hold off the world’s best in the final lap of a 5000m race, he would need strength. Salazar got him lifting weights alongside Galen Rupp, and the transformation of his physique was dramatic. In Alberto’s opinion, the seven hours every fortnight spent lifting weights in the gym played a more important part in Mo’s victories in London than the 110 miles a week of aerobic training. Thus, anecdotal evidence regarding both Paula Radcliffe and Mo Farah indicates that in individuals in who have an identifiable deficit in strength, resistance training including the lifting of heavy weights can produce worthwhile improvements in running performance. 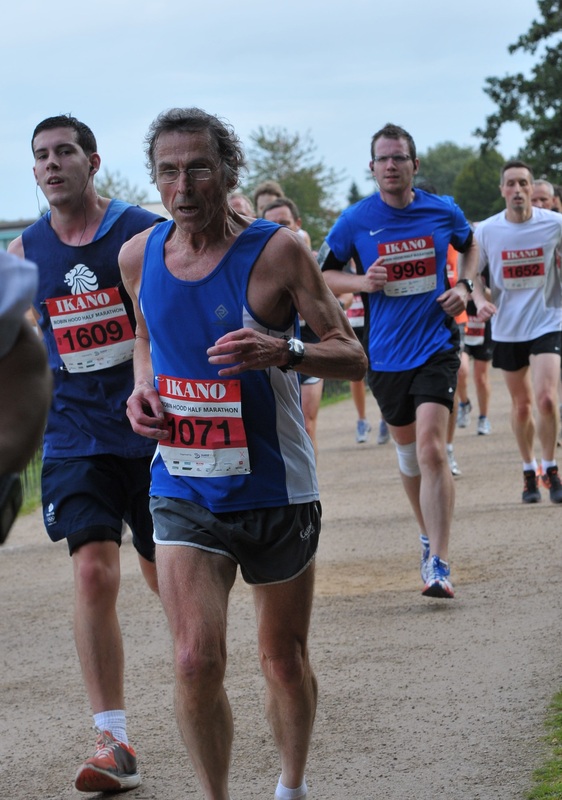 My goal is to run a good marathon at age 70 but the first step is to run a half-marathon in less than 100 minutes. I am now within sight of that goal, but I think the evidence that I am limited more by lack of muscle power than by my aerobic fitness in now unequivocal. There are several options: I could build type 2a fibres by running long hills; I could increase my strength and endurance by training in a weighted vest, just as I acquired the power required to run a marathon in under 2:30 over forty years ago by spending many days walking and climbing up mountains with a pack weighing between 30 and 40% of my bodyweight on my back; or I could lift weights. I think that in old age, as anabolic hormone production wanes, the surge of anabolic hormones produced by brief periods of heavy lifting makes weight lifting the preferred option. Lifting weights will develop type 2a aerobic fast twitch fibres. While these fibres are in themselves of considerable value when running near the upper end of the aerobic zone, especially on a hilly course, the major requirement for a marathoner or half marathoner, is abundant type 1 fibres. Gehlert’s study of cyclists who switched to program of high volume/low intensity training demonstrates that type 2a fibres can be transformed to type 1 fibres, at least in those individuals who have a predominance of type 2a fibres prior to the switch in training. Unfortunately, the role of other factors such as one’s genetically determined predisposition towards type fibre 1 dominance in promoting or inhibiting this transformation remain a matter for speculation. Whatever plans I make for training, it will be a unique experiment on myself. Neither anecdotal accounts of the experiences of others such as Paula Radcliffe and Mo Farah, nor systematic studies of groups such as that conducted by Gehlert will answer the question of how I can best develop the muscle strength that I require. However, the evidence suggests that the best strategy should include three phases: strength development; incorporation of this strength into a well coordinated relaxed running style: and finally the transformation of at least some of the type 2a fibres to type 1 fibres while I rebuild my aerobic capacity. Phase 1 (8 weeks) : primary goal – strength development. The key activity will be high load, low repetition weight lifting, together with hills and drills to initiate the incorporation the additional strength into running-specific action, and a modest amount of low aerobic training to maintain my current type 1 fibres. I anticipate increase in volume of type 2 fibres with only small loss of type 1. Phase 2 (3-4 weeks): primary goal – incorporation of strength into running action. I will do hills, drills and intervals to maximize incorporation of strength into a relaxed, efficient running action, with a small amount of weight lifting to maintain strength and a modest amount of low aerobic training. I will evaluate progress in a 5K time trial in January. The anticipated main changes in muscle will be refined recruitment of fibres rather than a change in fibre composition. Phase 3 (12 weeks): Primary goal – aerobic development. I will do predominantly aerobic training with increase in length of runs; some weight lifting to maintain strength; drills. hills and intervals to maintain speed. The program will end with a two week taper to a half marathon in April. I anticipate conversion of type 2a to type 1 fibres in this phase, but also hope to maintain a moderate proportion of type 2a fibres. Ewen has picked up the gauntlet in a challenge to be the first to break100 minutes for a half-marathon in April. My eyes remain focussed on the marathon in the long term, but in the short term, this virtual duel with a fellow spirit from the other side of the globe will add a little spice to my endeavours. Classically, a sprinter has the torso of an ox while a marathon runner has spindly legs and arms. Sprinters spend a substantial time in the gym lifting weights and afterwards eat a lot of protein; marathon runners spend even longer on the road depleting their muscle glycogen and then consume carbohydrate to replace it. When finishing a long run at a pace near to race pace, marathon runners are actually in danger of burning the protein from their own muscles. If they work with weights it is usually using high repetitions at moderate load to build up strength endurance rather than the power which a sprinter aims to develop with fewer repetitions with much heavier weights. These distinct training patterns have proven successful, on the one hand for many sprinters and on the other hand for many endurance runners. Clearly, the physiological needs of the sprinter, whose first requirements are muscle power and neuromuscular coordination, differ from those of the endurance runner, whose primary need is to supply oxygen and fuel to the muscles at a rate adequate to sustain aerobic metabolism for long periods. However, it is interesting to note that sprinting speed is a good predictor of one’s ultimate performance in distance events. Nonetheless, a novice endurance runner will get best value from time spent training by working on building aerobic capacity. A powerful engine is of little use without oxygen and fuel. But once oxygen and fuel supply are more than adequate, perhaps it is time to focus more on muscle power. There is an even more general rule about training and that is: repeating the same training stimulus time and time again yields diminishing returns. When the returns begin to diminish it is worth asking the question: what is now limiting my performance and what training stimulus might best break through the current limit? In recent years several illnesses and also lack of time for training had been the most easily identified limitations, but the past year has been different. I been free of illness and injury, and have actually spent more time training than during any year of my life – even those years over four decades ago when I could run a marathon in less than two and a half hours, though it should be noted that in those days, other activities especially mountaineering, contributed a great deal to my basic fitness. In the past year the time spent training has produced substantial gains. However, about three months ago, in the final few months of preparation for the Robin Hood Half Marathon at the end of September, it was clear that I had run up against a serious limitation. My aerobic fitness, as indicated by low heart rate when running at an easy pace, was good. My customary measure of aerobic fitness, the number of heart beats per Km, was typically in the range 630-640 b/Km during low aerobic runs, and there was very little upward drift of heart rate during long runs. I would have anticipated that such a level of aerobic fitness would allow me to maintain a pace in the range 4:35-4:45 min/Km for the duration of a half marathon, to produce a finishing time of 1:40 or less. But to my dismay, when I tried to maintain paces in this range, even for a few Km, I simply couldn’t muster the speed. I could not even maintain 5 min/Km pace for 4 Km. So it appeared that my limitation at that time was not aerobic fitness. 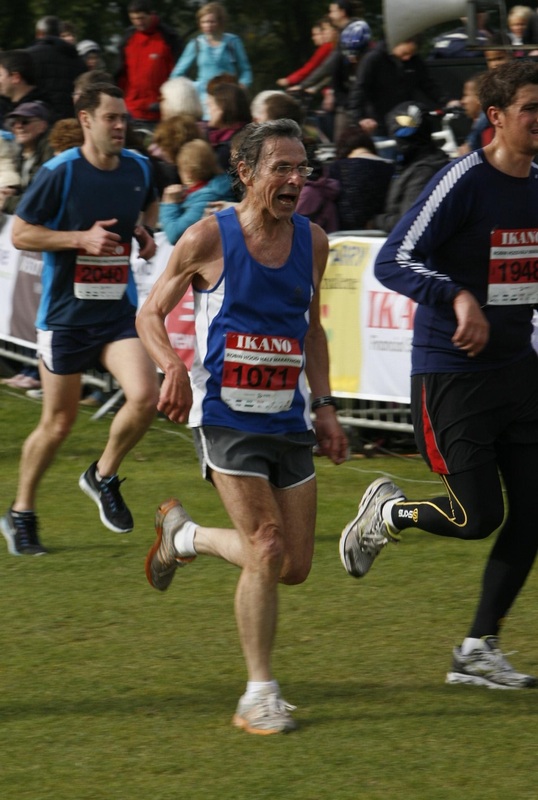 It was easy to identify the problem: the first factor is that I am in my late sixties, and suffering the general loss of muscle strength that accelerates alarmingly in the later part of the seventh decade. The second problem was that I had suffered an episode of acute arthritis two years ago that had affected several joints including my left knee. Painful movement leads to involuntary decrease in application of force, and as a result, my leg muscles, especially quads and hams, had atrophied even more than would be expected due to aging. The hopping test, in which I measure the total distance covered in 5 consecutive hops on one leg, had deteriorated dramatically from around 9.5 metres to 7.5 metres. In the subsequent two years lingering pain in the knee thwarted my attempts to introduce a program of plyometrics, while, ironically, marked pain in my arthritic left wrist made it difficult to lift weights. It was clear that I had to find some way around these problems. Fortunately, around the time I received an email out of the blue from a runner named Kieren. 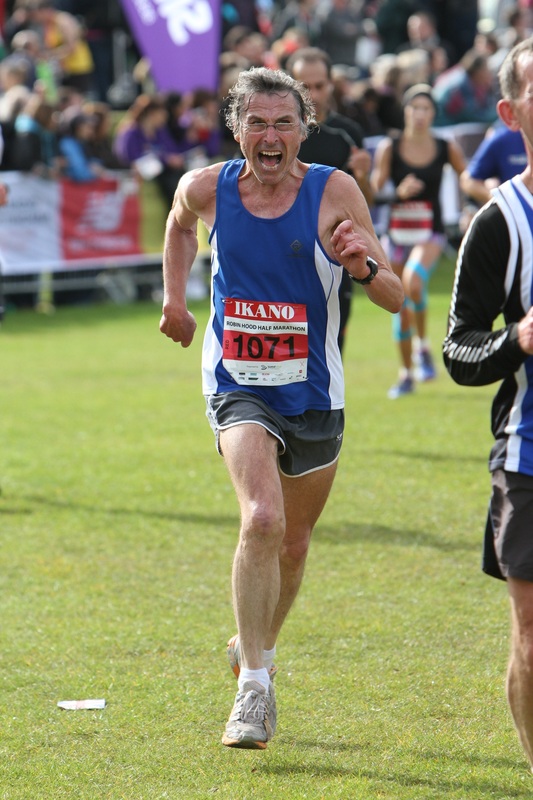 Several years ago Kieren’s blog had inspired me both to run and to blog, and I had been saddened when he suffered an injury, stopped running, and eventually stopped blogging. I had discovered incidentally that he still posted occasionally on the Fetcheveryone website, and I had been interested to see that he had taken up resistance training a few months ago. Although his recent email to me was triggered by my posts on heart rhythm, we got to discussing resistance training. He emphasized the value of squats for building ‘whole body’ strength, but especially for strengthening the major muscles of the posterior chain: the glutes, hams and hip adductors. He recommended an excellent book by Mark Rippetoe which provided detailed clear guidance on how to squat safely and effectively. As I mentioned in a previous post, at that stage I commenced a gradual progressive build up of weights and after four weeks was delighted by two outcomes: my painful arthritic wrist was much less painful, presumably due to increased support by stronger forearm muscles, and my pace during stride-outs at around 80% maximum effort, had increased, though of course, this is a rather imprecise measure of improvement. Nonetheless, the signs were encouraging. But by that point in my preparation for the Robin Hood half marathon, it was necessary to revert to predominantly aerobic training. However, I continued with body weight exercises and drills. Although there was not time to properly assess my ability to sustain a higher speed in those final few weeks before the race, short tempo runs during the taper suggested that I was now able to maintain a pace of 5 min/Km or even a little faster with reserve power. In the event, this proved to be the case. I crossed the line in 1:41:50, reflecting an average pace of 4:50/Km for the full 21.1 Km. Some of this improvement was no doubt due to a successful taper, but on balance, the prospects for further improvement with continuation of strength development looked promising. But before committing myself to a major program of resistance training, it is necessary to consider the crucial issue of possible weight gain. For the sprinter, the greatest energy cost of running is the cost of re-positioning the swinging leg. 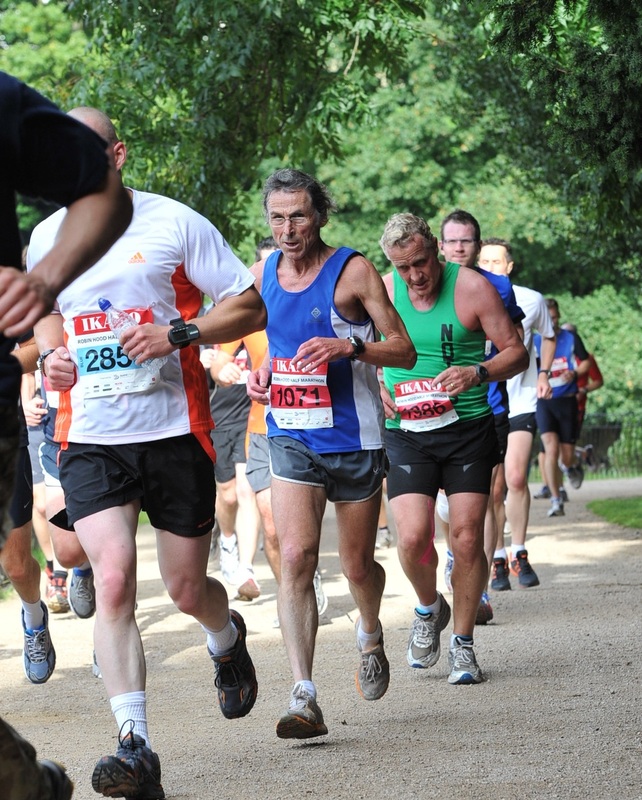 But at the paces typical of endurance running, the greatest cost is the cost of elevating the body on each stride, and this cost is directly proportional to body weight. 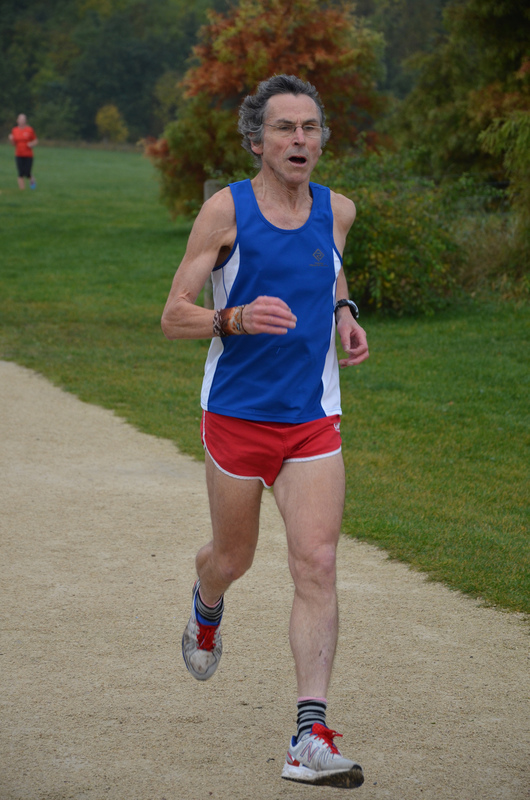 Irwin Stillman estimates that a long distance runner should weigh 15% less than the average non-athlete of the same height, though some coaches consider that 10% less than average is ideal. Until one reaches the state of emaciation where hormonal and immune function begins to be compromised, loss of fat is almost certainly beneficial to the distance runner. Weight training is potentially effective for promoting fat loss, and therefore, a substantial proportion of the weight change in early stages of a weight lifting program are likely to a beneficial loss of fat. I am currently about 9% below average weight for my height, so I do not need to lose much more weight. Some of this deficit is due to muscular atrophy, so I will probably profit from replacing fat by muscle. But depending on the regimen adopted, gain in muscle mass from weight training might well overshadow the loss of fat, especially for a distance runner with little fat to spare. So if my running performance is to improve, it is crucial that any gain in muscle mass ‘pays its way’ by producing an increase in power output that more than compensates for the extra work I will have to do in order to get airborne on each stride. It will also be crucial to ensure that I maintain the ability to deliver enough oxygen and fuel to the muscles to sustain aerobic metabolism for several hours. This brings us to the key issue of types of muscle fibre. The sprinter relies largely on type 2B fibres, anaerobic fibres dominated by massive contractile machinery capable of rapid, and hence powerful contraction. Muscle contraction is produced by the ratchet-like interaction of actin and myosin fibrils that slide past each other as a result of making and breaking molecular bonds, employing energy provided by the energy molecule, ATP. Several different types of myosin fibrils exist. Type 2B fibres contain ‘heavy duty’ myosin capable of very rapid contraction. Thus, type 2B fibres are best equipped to utilise readily available ATP and creatine phosphate, which can be rapidly converted to ATP. Although oxygen is subsequently required to replenish the supply of ATP and creatine phosphate, this is usually done at a leisurely rate during recovery. Therefore, the development of type 2B fibres sacrifices capillary density for the sake of contractile machinery. These type 2B fibres are of limited use to a distance runner. The distance runner relies largely on type 1 fibres in which there is a balance between contractile machinery and capillary density, and it addition, abundant mitochondria. The mitochondria contain the oxidative enzymes required to generate ATP by oxidizing fuels such as glucose. Thus type 1 fibres are well suited to aerobic metabolism. However, the variant of myosin in type 1 fibres can only contract at about 1/10th the rate of the variant found in type 2B fibres. Therefore the type 1 fibres are best suited to producing a modest power output for long periods using aerobic metabolism. But it is unlikely that lifting heavy weights will do much for the development of type 1 fibres. Before tackling the crucial question of the possibility of converting type 2A fibres to the type 1 fibres required by the distance runner, it is intriguing to ask how it is that weight training helps sprinters develop the type 2B fibres that are the key to speed. Enigmatically, the answer appears to be: by doing very little. It appears that type 2A fibres naturally revert to type 2B fibres when not subjected to repeated loading. It is probable that type 2B fibres are the default state to which other fibres regress if not required to work. This is illustrated by the fact that after a period of paralysis, the proportion of type 2B fibres is high. Thus, it is likely that the best strategy for a sprinter is marked periodization. In the pre-season, he/she should lift heavy weights, leading to the development of type 2A fibres. Then during the competitive season, the emphasis should be on sharpening neuromuscular coordination. Meanwhile the type 2A fibres developed during the pre-season weight lifting will revert to the required type 2B fibres. But can an endurance athlete convert the type 2A fibres to type 1 fibres? The answer is less clear. It appears to depend on the initial fibre composition of the muscle. In a study of 21 cyclists who undertook training program in which volume of training was increased while intensity decreased, there was a significant decrease in proportion of type 2A fibres and a trend toward increased proportion of type 1 fibres, when averaged across the entire group. However, perhaps the most important finding emerged when the 21 cyclists were subdivided into a group with high initial proportion of type 1 fibres (the HPS group) and those with a low initial proportion of type 1 fibres the LPS) group. In the HPS group, the change to higher volume, low intensity training produced no appreciate change in fibre composition, whereas in the LPS group, there was a marked increase in type 1 fibres and a decrease in type 2A fibres. The question of whether or not the difference in initial proportion of type 1 fibres was determined by genes or by previous training was not addressed. Thus, the study demonstrates that an increase in training volume and reduction in intensity is likely to produce a shift from type 2A to type 1 fibres in some endurance athletes, but not in others, and that difference in training effect is determined by the proportion of type 1 fibres at the beginning of the high volume training. Unfortunately, the question of whether it is the genetic influences on the initial fibre composition or previous training experience that determines the likely outcome remains unclear. However, it seems to me that prior training is the mostly likely factor, since cyclists with a genetic predisposition to a preponderance of type 1 fibres would have been more likely to be in the HPS group at the start. I suspect that due either to my genes or to my childhood experience of running to and from school, I have a natural preponderance of type 1 fibres, and therefore, in my present state, further high volume. low intensity training will not increase my proportion of type 1 fibres. However, the available evidence indicates that a program of weight lifting might increase my proportion of type 2A fibres and subsequent high volume, low intensity training might lead to an increase in type 1 fibres. The available evidence also indicates that the outcome of training depends on one’s initial state at the beginning of the training. There is no single answer to the question of how best to train. But after a careful evaluation of my own condition, I think that a program of weight training is a good bet in my case. However it is also noteworthy that in order to achieve the distance runner’s theoretical ideal of a very low amounts a type 2B, moderate proportion of type 2A and a large proportion of type 1 fibres, I need to revert from weight training to aerobic training well in advance of my next half marathon. There are additional issues to consider. These include the effect of weight training on hormones, especially growth hormone, and also the question of what particular exercises I should include in my weight training program. I will return to each of these questions in future posts. I will finish this post with an account of how I plan to monitor progress. I will monitor three ‘running specific’ variables: my time for a 5K, the distance achieved in 5 consecutive hops on one leg, and my weight. With regard to 5K performance, I did my base-line test in a parkrun last Saturday. I achieved a time of 22:19. I was delighted with this, since in my first parkrun a year ago, run after about three months of systematic training, including both hills and intervals, I had achieved a time of 24:48. Thus, in the subsequent year, I have managed to reduce that time by about two and a half minutes. Whether this reduction can be attributed to the intervening aerobic training or to the resistance work and drills over the past few months in uncertain. The fact that I could not maintain 5 min/Km pace for 4 Km three months ago, at the end of a long period of predominantly aerobic training, suggests that it was a combination of both. Thus, I am cautiously optimistic that an appropriately periodized combination of weights, drills and aerobic training will lead to yet further improvement, though of course, reduction from a starting point of 22:19 is a greater challenge than reduction from a starting point of 24:48. 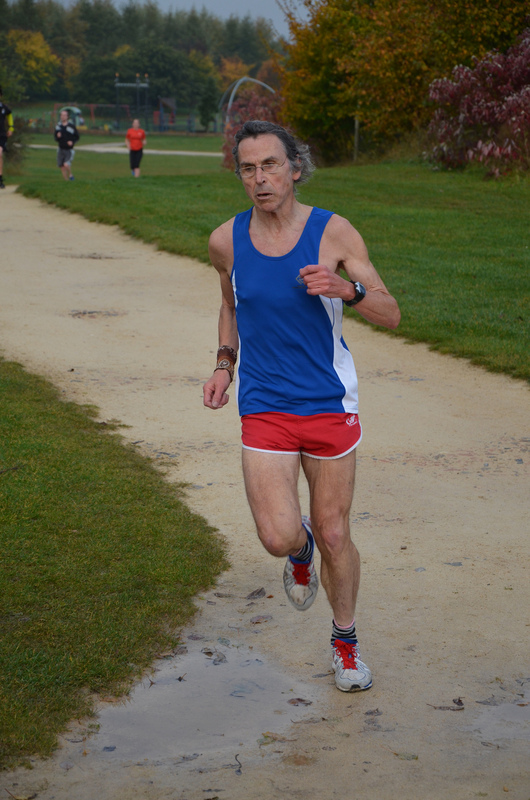 An finally, as a counterbalance to the somewhat gruesome photos of my efforts to conjure speed from my atrophied leg muscles in the RH half marathon, here are some photos taken during the two-lap parkrun on Saturday, by the husband of Plodding Hippo, a runner and doctor whose wisdom on running-related medical matters is much valued by readers of the Fetcheveryone website. 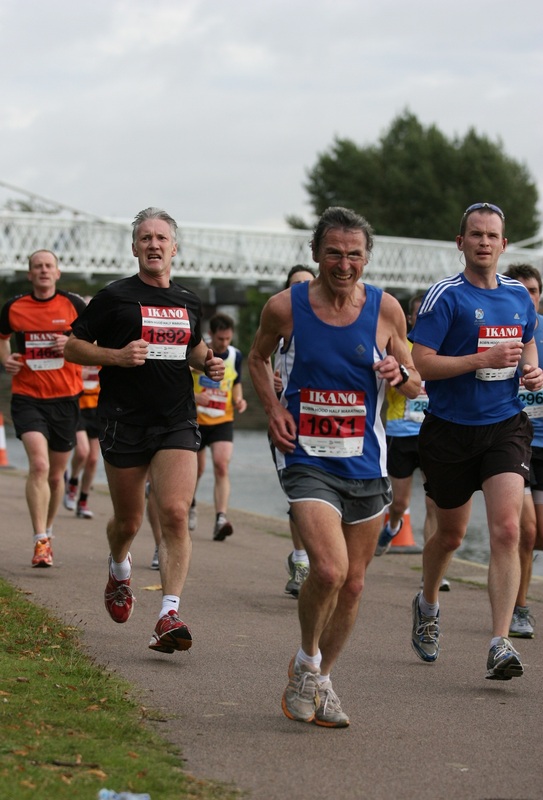 You are currently browsing the Canute's Efficient Running Site blog archives for October, 2012.